Creating a memorable experience for the hotel guests is any hotel’s top priority list. First impression matters and your landscaping are one of the aspects that contributes to overall business success. From lush greeneries landscaping to ancillary services, they will give you an opportunity to make a lasting impression that guests will never forget and keep them coming back to your hotel. If your hotel rooms are not tidy and unimpressive, your brand image will suffer. As you step in towards any hotel front door, you notice the brightest green colours and colourful flowers. You can hear the soothing mist of sprinklers and the calming sound of the tree breeze. The huge trees bring shades that made you overwhelmed in total relaxation. What a way to start a holiday at the hotel or even visit shopping malls. Beautiful landscapes and superb landscaping features increase the value of the business and generate more profit. Promoting a well-designed and eco-friendly landscape area would set your business apart from your competitors and attract new customers. These days people carry a lot of mental stress in their daily lives and the natural elements of greeneries are one of the natural remedies for people to break away from stress. There is a tremendous demand by guests and potential customers to see more of green trees and beautiful flowers because it gives a feeling of relaxation, healthy and healing experiences. The hotel gardens provide a habitat for wildlife, cool the hot weather, shade the area, protect buildings from the wind, purify the air and help to reduce dust. The natural garden landscapes will motivate guests and visitors to visit and return to the hotel. Consumers grow more conscious of environmentally products or services. Thus, when an organisation is more committed to greenery landscaping and its maintenance, its business is prone towards eco-environmentally friendly and socially strong. 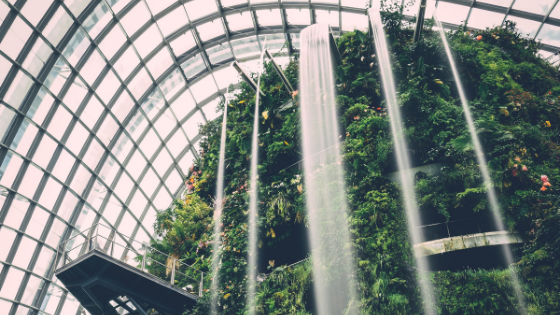 Consumer preference nowadays shifts towards sustainability and by creating the landscaping atmosphere, it can give your business a substantial lift. The sustainability concept identifies as social trends that can advertise your hotel’s rooms or dine-in restaurants, through spreading in websites and in social media platform. Whether the business implements the eco-friendly practices on selling product or services or not, it matters to customers and become a deciding factor to make their preferences and choices. Eventually, these eco-friendly practices can increase the interest of people wishing to visit the hotel and increase the tourism rate. Beautiful landscapes can also increase the value of your hotel or resorts and beautify your property to be more attractive for purchasers and guests. Besides that, landscaping services can save cost on heating and cooling expenses. Since landscaping cools down the building temperatures from sunlight, it can save air conditioning electricity cost. When people attempt to do landscaping by themselves, they might not have enough expertise and knowledge for landscaping and might potentially risk damage the value of their land. Hiring professional landscapers who have the expertise and credentials to having awareness in choosing the right type of plants and vegetation, installing the most economical yet aesthetical landscaping features, building the drainage system and simply designing the landscape with a unity of the hotel building through careful planning. What is your ideal workplace or holiday? When we observe in television shows, movies or travelling videos, they might probably relate to investing into the environment. Landscaping brings employees and guests to radiating happiness as well as experiencing a positive psychological effect. The nature atmosphere comes through natural light, window or door fixtures that show a beautiful façade on the building. Green environment keep employee healthy, improve productivity and less sick leave. The study reveals that employees who are in direct contact with nature at workplace setting may be health promoting. For example, the workplace setting includes indoor plants, relaxing outdoor gardens and the office windows view are related to less stress and low anxiety. Stress can affect the quality of life and mental health as well as increase the likelihood of chronic disease such as cancer or heart attack (Larson, Adams, Deal,Kweon & Tyler, 1998). In other words, employees become happier, more satisfied and less stressful if there are plants lingering around their workplace environment. Nobody enjoys the messy environments such as overgrown grass, yellowish lawn, dark and desolate places, old unmaintained bricks or poor colour unity landscapes. Nowadays, natural light and landscaping create the basic company need of wants. Most successful companies invest on outdoor or indoor landscaping spaces and its maintenance to maintain a good impression where employees and guests can enjoy the fresh air, relaxing breaks while interacting with nature. The hotel garden is a place where visitors and guest can enjoy the spectacular view, do exercise activities, come to eat or drink and entertainment. Creative designed gardens can influence guests to recommend the hotel to others and make them return visits. When the rain begins to fall on the ground, and the water flows pushes the sediments or dirt away from one place into nearby rivers, streams, drainage, shrubs or other landscape places. Plant and trees help to prevent the soils moving around, to reinforce the soil and to keep the soil in place. The landscaping can reduce the stormwater runoff which prevents the local flooding and control erosion by reducing soils in waterways. In other words, these green landscapes help to stabilize the soil and prevent erosion of soil because the effect of soil erosion can lead to floods, mudslides and affect the buildings or roadway structures. Building a retaining wall helps to prevent soil movements when it rains but it can be costly compared to having natural landscaping that can do the work effectively as well. The root of trees and plants can act as a filtrations system to filter out the pollutants particles on water areas such as lakes, oceans or rivers. The plant also filters the rain waters, from dust, and help to lower down the temperature especially at urban areas. Atalian Global Services provides professional landscaping and ground maintenance services and dedicated to beautifying your landscapes for your business. On this season, we can put a fresh new face on your landscapes gardens whether they are indoor or outdoor landscapes that will definitely look inspirational. Atalian offers the best landscaping and ground maintenance service that is tailored to your specific needs and provides a suited package for you. Do contact us for a free consultation today for more information about our services.